Clorox Urine Remover For Stains And Odors Tackles The Toughest Urine Stains And Odors. 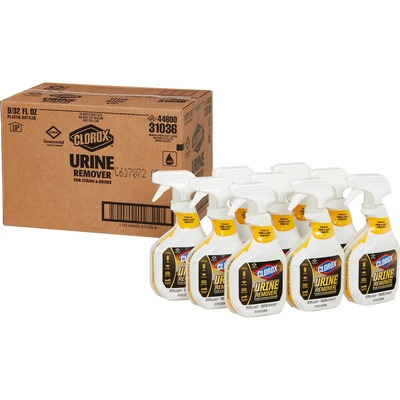 With The Cleaning Power Of Hydrogen Peroxide, It Quickly Breaks Down Urine To Eliminate Odors And Remove Stains. This Versatile Cleaner Is Safe To Use On Most Hard And Soft Surfaces. It Is Specially Formulated For Tough-To-Clean Porous Surfaces, Like Grout, Notorious For Trapping Urine Odors. It Also Handles Stains And Odors On Soft, Absorbent Surfaces Like Carpet And Mattresses. This Urine Remover Is Also Great For Outdoor Concrete, Walls And Flooring, Laundry Pretreatment, Pet Stains And Bodily Fluids Removal Including Feces, Blood And Vomit. From Clorox Commercial Solutions, This Powerful, Nonbleach Spray Cleaner Is Perfect For Use In Hotels, Long-Term Care Facilities, Locker Rooms, Schools And High-Traffic Restrooms. With The Smart Tube Technology, You Are Guaranteed To Spray Every Drop..
Clorox Urine Remover For Stains And Odors Tackles The Toughest Urine Stains And Odors. With The Cleaning Power Of Hydrogen Peroxide, It Quickly Breaks Down Urine To Eliminate Odors And Remove Stains. This Versatile Cleaner Is Safe To Use On Most Hard And Soft Surfaces. It Is Specially Formulated For Tough-To-Clean Porous Surfaces, Like Grout, Notorious For Trapping Urine Odors. It Also Handles Stains And Odors On Soft, Absorbent Surfaces Like Carpet And Mattresses. This Urine Remover Is Also Great For Outdoor Concrete, Walls And Flooring, Laundry Pretreatment, Pet Stains And Bodily Fluids Removal Including Feces, Blood And Vomit. From Clorox Commercial Solutions, This Powerful, Nonbleach Spray Cleaner Is Perfect For Use In Hotels, Long-Term Care Facilities, Locker Rooms, Schools And High-Traffic Restrooms. With The Smart Tube Technology, You Are Guaranteed To Spray Every Drop.